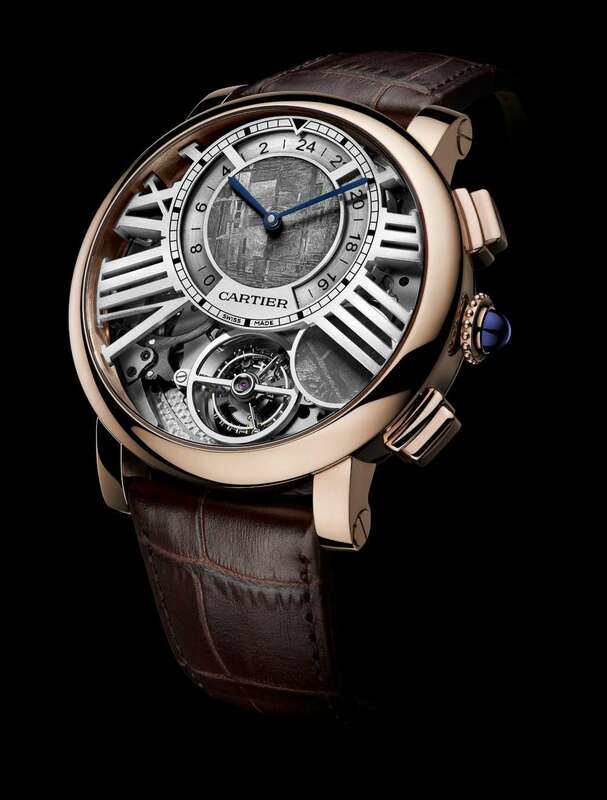 The Cartier Rotonde de Cartier Earth and Moon, reference WHRO0013, is the latest version of a watch introduced in 2014, with lapis lazuli dial and a stylized globe at 12 o’clock. This year’s version features two discs of meteorite stone, one on the 24-hour subdial at the top of the watch, and one on the disc that can be seen below the Roman numeral 4. The result is a watch that looks tough and mysterious, with the white gold and meteorite of the dial contrasting with the pink gold of the case. It’s a very large piece, at 47 mm diameter and 16.65 mm thickness, with a brown alligator strap with pink gold folding clasp. 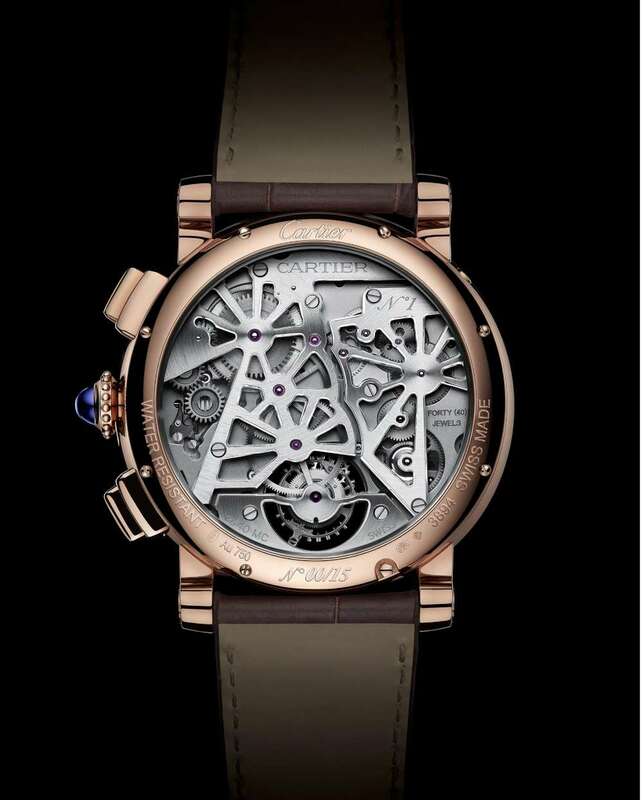 Its unique appearance is based on a very three-dimensional construction, with the numerals slung above the movement, and the tourbillon placed in a well at 6 o’clock. The irregular meteorite texture is enhanced by the brushed finish on the vertical inner face of the case. The watch has an original set of functions, with a 24-hour disc for a second time zone, adjusted by the pusher at 2 o’clock, and a moon phase on demand function activated by the pusher at 4 o’clock. When you press the pusher, the disc under the 4 o’clock numeral swings down and covers the tourbillon to a degree corresponding to the moon phase. It’s a bit like the circular palette in Jaquet Droz Eclipse moon phase watches, but in the Cartier piece, they are cleverly using a circular element that is already there – the tourbillon – for another function. The watch is powered by the hand-wound caliber 9440 MC movement. This is only 5.65 mm thick, and so the thickness of the complete watch is a result of the dial architecture. The tourbillon balance runs at 21,600 vibrations per hour, 3 Hertz, and the mainspring provides about 72 hours of power reserve. The view through the caseback is as iintriguing as the front side, with bridges skeletonized into interlocking star-shaped patterns. The watch has a sort of steampunk aesthetic that adds to its allure. The watch also has a powerful symbolism that is heightened by the use of meteorite. The top part of the dial, with the time and 24-hour indications, represent the earth, the tourbillon and the moon phase disc represent our satellite, and the meteorite is a reminder of the universe with its 15 billion years of life since the big bang. 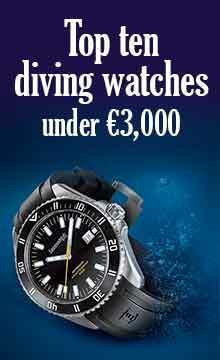 More than most, this watch helps put man’s efforts at keeping track of time into the larger scheme of astronomical time. 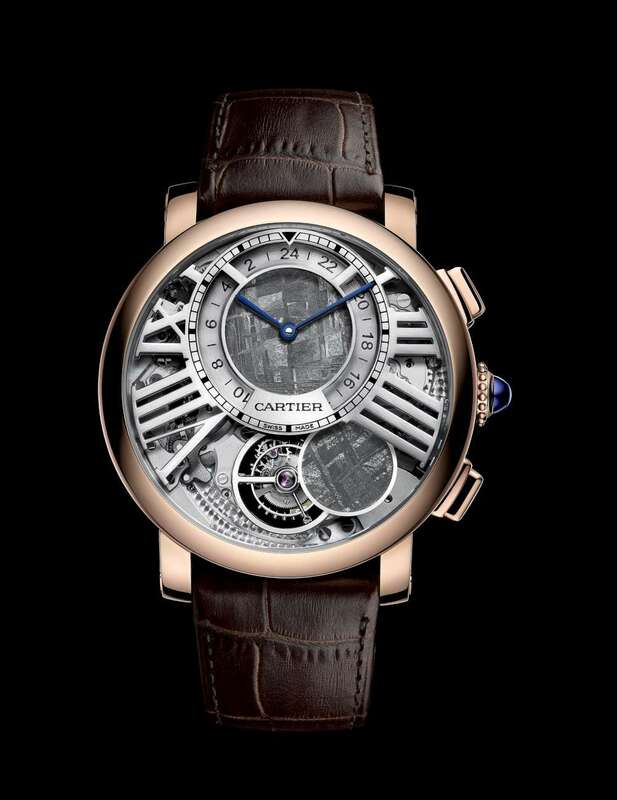 The Cartier Rotonde de Cartier Earth and Moon is reference WHRO0013, a limited edition of 15 pieces. Price is US$ 235,000 each. More at Cartier’s website.